When you first start Life is Strange Episode 2, you’re met with a screen. It’s a screen any fan of the series will be familiar with, reminding you that your decisions will have consequences that might span out of this episode and into the rest of the series. But there is something else in Episode 2’s message that made my heart stop. It told me that it had successfully imported The Awesome Adventures of Captain Spirit, that freebie minisode that left us all a wondering what Life is Strange 2 would be like. Knowing that Chris’ heartbreaking story would collide with Sean and Daniel defines the brutal responsibility that is felt throughout this episode. Episode 2: Rules highlights the biggest changes between the original story and this one. Sean and Daniels’s transient life is now in full swing and as a result, you don’t see much of anyone from episode one. 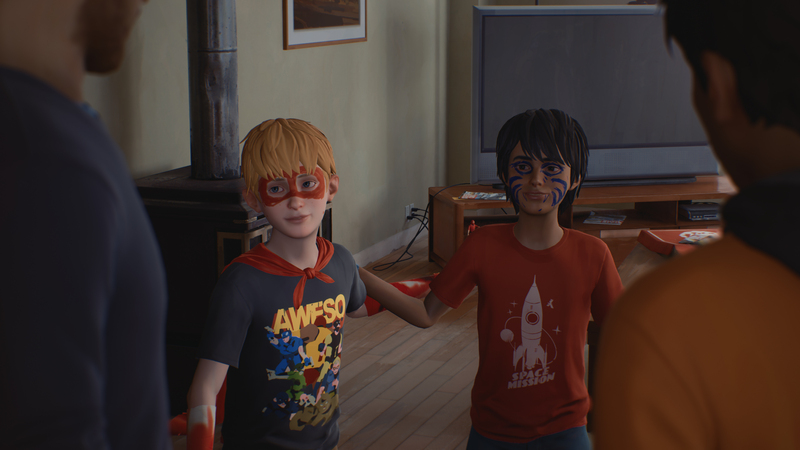 Rather than getting to know several side characters that exist in the background of the main story, Life is Strange 2 and especially this second episode focuses on the dynamic between the central brothers. It’s a shame that you don’t get the recurring cast that felt so interesting in the first game, but this does give you the chance to meet slightly more unusual characters and tell strange, singular stories. Obviously, there is one familiar face, a superhero known as Captain Spirit. If you haven’t played his free minisode I can’t recommend it enough before starting Rules. It tells a short self-contained story that bleeds through into Rules in a really thoughtful way. But it is well worth getting to know Chris before he’s introduced in the main series, as the game obviously assumes you already know his story. But his inclusion defines the relationship between Sean and Dan in Rules. Sean has shrugged off the reluctance of his role and is now the responsible mentor figure in Daniel’s life. Once again the decisions you make in this episode influence Daniel in ways that you cannot directly control, making you responsible for teaching him how to behave. The game immediately frames each decision you make through the lens of Daniel experience. From the earliest choices, players have to decide what is best for both the situation and the long term effects. Some of the decisions can be more easily read than others, and you can predict some of the long-term outcomes. But what the game does really well is making the decisions hard, even if you think you know what the outcomes are. Normally the choice is between protects Daniel and his secret, or someone else. After spending so long with Daniel and feeling protective of him, it is really quite tough to put anyone else first. And speaking of secrets, with both the fate of their father and Daniel’s powers exposed, the relationship between the brothers really has the chance to blossom in the challenges they are facing. Neither brother is hiding anything or withdrawing, which means you really instantly get an attachment for the bond between them. But Daniel’s power is also improving. The game begins with the teaser at the end of Episode 1, with the boys practicing with his abilities. But they have become a much a larger part of the story, with Daniel desperate to use them and Sean having to find some kind of balance. It doesn’t necessarily come up so much this episode, but you get the impression that his powers might make him stronger than Sean, but clearly doesn’t have the maturity that goes with it just yet. If you hadn’t noticed already, I’ve been trying really hard to avoid spoilers in this review of Life is Strange 2 Episode 2. This is a narrative game and I don’t want to ruin the emotional experience for anyone playing it. That said, while I will avoid any details, I’m going to talk about the game’s impact on me. If you want to go in blind, feel free to stop here. Life is Strange 2 Episode 2 is fantastic and really takes you into the role of the older brother, and all the artificial stress that brings. But it is also one of the saddest episodes I’ve ever played. From the tension of responsibility to some truly heartbreaking scenes, this is a game that takes you on one hell of a rollercoaster. One moment, in particular, was incredibly well shot and really impactful. Worst of all, it was a consequence for decisions I made earlier in the episode. Looking at the stats at the end of the episode it seems it was entirely avoidable which makes the outcome so much more upsetting. The choices, in general, feel much more nuanced than episode one and in fact the original game as well. While you’ll probably be given a binary choice, Daniel’s own mood will probably influence the result as well, making everything you say to him much more important. While there were a few technical hiccups throughout the episode, it stands as one of the best in this already stellar series. From the conversations that wonderfully introduce passing characters and flesh out their relationships to the way the narrative forces you into tough decisions, this is what a narrative adventure should feel like. Black Mirror: Bandersnatch might have got all the attention, but Life is Strange 2 Episode 2 deserves all the praise. Reviewed on PlayStation 4 (code provided by the publisher). You can purchase the full season of Life is Strange 2 for PC via Green Man Gaming and for Xbox One via Microsoft Store. Life is Strange 2 Episode 2 shows exactly how interactive narrative games can be so powerful. By focusing on your responsibility for two characters and their actions, players can enjoy the heartbreaking story they accidentally unfold.